The University of Michigan Library has completed digitization of its Women Composers Collection, which contains approximately 2800 musical works by women composers. With the exception of several dozen 18th-century works, the music is almost evenly divided between the 19th and 20th centuries. The collection contains music in a variety of genres; songs and solo piano music predominate, but choral, orchestral, dramatic, and chamber music are also represented. Approximately 80% of the works are in the public domain and thus are available in full text. The bulk of the material was assembled by a British antiquarian, from whom the Library purchased the collection in 1980, after which the Music Library added a few hundred more works. Most of the scores are first or early editions, and since many have not subsequently been re-published, much of the content is rare or even unique. Some pieces include markings or corrections from the composers themselves, and nearly 250 are manuscripts. 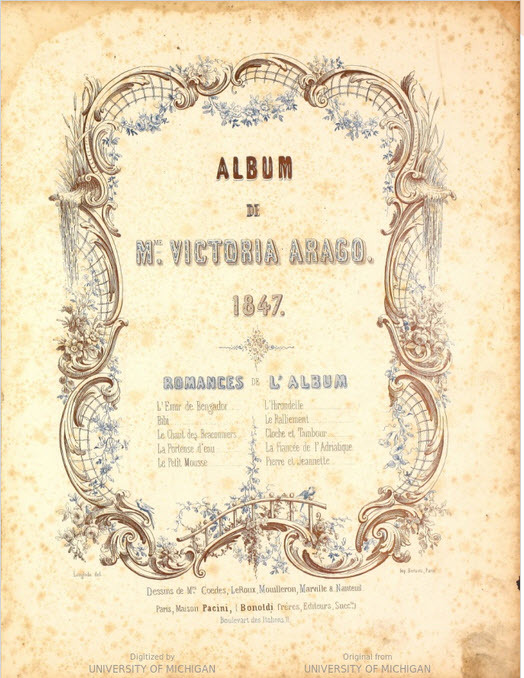 The collection contains the works of more than 700 composers. The majority are French or British, while composers of the United States, Germany, and elsewhere are also included. Among those most heavily represented are Loïsa Puget, Cécile Chaminade, Augusta Holmès, Pauline Viardot, Ethel Smyth, Jeanne Boyd, Jane Vieu, Elizabeth Gould, Hedwige Chrétien, Harriet Ware, Carrie Jacobs-Bond, Pauline Duchambge, Liza Lehmann, Virginia Gabriel, Marguerite Roesgen-Champion, Mel Bonis, and Evelyn Sharp. Retrieve (or search within) the full collection in our local catalog using the phrase "women composers collection"